Since Alissa has aroused your curiosity, I will tell you what the smell of a skunk means to the Rausch family. As you would expect, it's NOT pleasant! We live on a small farm in a very old house. It has taken many years to bring it up to modern standards, and one of the conditions we lived with for many years was an open foundation. Our house was originally built on stacked flat rocks, and it was anywhere from a few inches to a foot off the ground. We worked gradually on getting a footer and foundation installed underneath the house, but for many years, we had some sections that were open to the air, and to the wildlife. We had a possum living under our bathtub for awhile, and I'm sure we had mice under there, too. But the worst thing that ever took up residence under our kitchen was a skunk. It liked it there, and there was no way to lure it out without risking it spraying its distinctive odor. After wracking our brains and suffering the stink for a few days, Terry finally borrowed a "catch-'em-alive" trap from our friendly hardware store owner, and he baited it and waited for the skunk to enter it. First we caught our cat, but finally we caught the skunk. We went outside to find the skunk sleeping peacefully in the cage. Now what to do? If Terry picked up the cage and disturbed the skunk, he risked getting sprayed-and we didn't have enough tomato juice to bathe him in for that! He decided it would be best to shoot the skunk in the head while it slept so that it wouldn't spray. He got his gun and put a shot neatly in the skunk's head, killing it instantly. But do you know what? Skunks spray as they die! And their spray is neon green! You learn something new every day, and this lesson is one we could have all done without! Terry didn't get sprayed, but the ground did. The ground outside the kitchen window was saturated with the spray, and the odor was overpowering. The kids and I had to clear out while poor Terry tried to clean up the mess and dispose of the dead skunk. He ended up wrapping it in several layers of plastic and putting it in the back of his truck to take off to work and dump in the dumpster. It didn't help the smell of the truck, either. Anyone who knows me knows that I have a sweet tooth. However, it's a pretty discriminating one. I eat dark chocolate all year-for health reasons, ostensibly. It's not my only guilty pleasure, but I indulge in all my other favorites in particular seasons of the year. For example, it seems I like circus peanuts in the summertime, for whatever reason. I eat candy corn and peanut butter kisses in the fall, for obvious reasons. In the spring, it's Peeps season. I LOVE Peeps, and I have since I was a very little girl. About the time of the beginning of Lent, when I see them in the stores, I am ready to indulge my sweet tooth. I allow myself one large package of Peeps per week from now until shortly after Easter, when my supply has always dried up. I think of all my favorite candies, Peeps are the ultimate ones for me. They are very sweet and gooey, and I can eat and eat them. I have to dole them out to myself, or I would be the size of a boat, not that I'm dainty as I am. They are really best when they get stale and chewy with the sugar turning crusty on the outside. However, it's not often that I can manage to let them sit around in an open package long enough for that to happen. It used to be that Peeps were only available in the season before Easter, and, in my opinion, that's they way it should have stayed. However, the people at the Just Born factory in Pennsylvania have branched out. 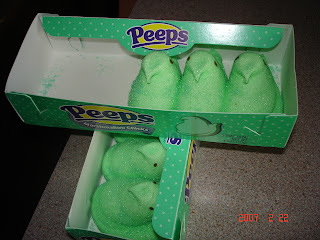 Not only do Peeps now come in colors other than the traditional yellow and pink, but they also are available now in many shapes and colors for other seasons as well. I will eat Peeps of a different color, but I just can't see eating them as black bats, orange pumpkins, red or white or blue stars, green Christmas trees, or white snowmen. That's just wrong. I don't know how well these other Peeps sell in the other seasons, but I for one don't buy them. Peeps are for the Easter season. Summer, fall, and winter are for other candies, for goodness sakes! Sue , this one's for you. You wanted to see a picture of my going-away outfit, so here it is. For anyone who couldn't figure it out, I'm the one on the left. The other girls were my best college buddies. The dress and coat were made of ecru linen, and the dress inside was a sleeveless a-line sheath. I was wearing an orchid corsage. The orchid was detached from the center of my wedding bouquet. That was how many bouquets were made at the time. The shoes were the height of fashion, brown mary-janes. It was a very cold day, and there was an ice storm going on, so I was pretty near freezing. I shopped for a long time for this outfit, but then, as now, winter clothes could not be bought in the winter. Since I hadn't bought the outfit six months in advance, I had to buy spring clothes when I shopped. I must have just put this on right before the picture was taken, or at least I hadn't sat down, because it seems, if memory serves, that the outfit wrinkled if you just looked at it crooked. I doubt I wore it very much after this occasion because it had to be dry-cleaned, and it was impossible to keep neat-looking. Not the wisest clothing purchase I ever made. Of course, this outfit looks pretty conservative compared to many of the clothes that were the style in the early 70's. My kids love to look at the pictures of my jumpsuits and hot pants outfits with knee-high boots. I loved the jumpsuits, but I really didn't like the hot pants outfits. I wore them because Terry bought them for me, and he liked them. I didn't wear them often, however, because I tended to be conservative in my dress, and I felt like I stood out like a sore thumb when wearing them. Another clothing trend was culottes with opaque hose, which I liked to wear a lot. 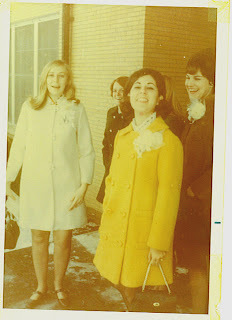 When I started teaching in September, 1970, dresses and skirts were required wear for female teachers. During that first year I taught, the rule was made that we could wear pants suits. Not just slacks and sweaters, mind you, but actual dressy outfits with matching tops and bottoms. I was really glad to see that happen, because my legs never have been my best feature, and I was more than happy to cover them up. I went out and bought several to go with the short dresses and skirts that were also the style. Not so surprisingly, much of what was popular then has returned to fashion today, just with different names. Hot pants are just short shorts, but I don't see too many people wearing white patent leather knee-high boots with them, which is just as well, believe me! Culottes are today's split skirts, and I see them a lot on the fashion pages, along with jumpsuits. Fabrics are different, and so are the names, but the trends are the same. I even saw a pair of shoes EXACTLY like my favorite shoes of the 70's made by the same manufacturer advertised in the paper last week. I could hardly believe my eyes. I guess the more things change, the more they stay the same. Today is our anniversary--37 years of wedded bliss, so to speak. Not all bliss, by any stretch of the imagination, but definitely good enough to make it work! :) You can see we have both changed more than a little. Even though you can't see it, we have changed inside as well, both of us for the better, as opposed to how our exteriors have changed. 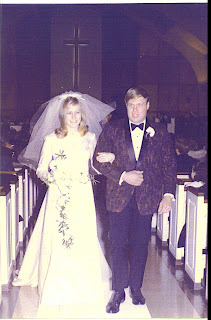 We got married on Valentine's Day, 1970. Most people think this sounds romantic, but actually it is just because the holiday fell on a Saturday when Terry could get vacation time. Terry always has, however, remembered our anniversary, so this is good. The weather the day we got married was cold. It had snowed about 6 inches the night before the ceremony, but by 2:00, when the wedding took place, the roads were clear, so we had a good turnout. However, by the time our reception was over, a freezing rain had started to fall, and everything was icing over. It turned out to be the worst ice storm in Louisville's history, and we felt the beginnings of it as we headed out of town to Lexinton on our honeymoon. By the time we got there, roads were shutting down, and our car was covered with ice. It was a nerve-wracking drive, and we were both just plain exhausted when we checked in to our room. It was a good thing we had reservations because many people were spending the night in the lobby. We were glad to head for Florida the next day and get away from the mess. However, back to the wedding itself. I really remember only bits and pieces of the event and the activities leading up to and following it. I remember getting dressed at the church and having my sister-in-law give me a drop of Binaca mouthwash and me spilling it on my beautiful wedding dress. It left a mark that stayed all day. I remember when the minister said, "Join right hands," and I put out my left one (I am left-handed, after all). I remember many friends from school and students that I had just been student-teaching being there. I remember that there were lots of people who wanted to talk to us, and that we were seemingly flitting from one group to the next. We didn't sit and eat, nor did we dance. We did open some gifts, which isn't done today. I remember changing into my "going-away" outfit of a linen dress and duster, only to go out in the freezing rain and get chilled. I remember one of us forgetting Terry's shaving kit at my parents' house and having to go back and get it before we ever got out of town. He was not happy about that and seemed to think it was my fault. I, of course, felt otherwise. Not a good way to start a honeymoon, but I know it was the stress of the wedding and then driving in all that mess in a car that was designed for speed, not bad weather. I remember that I was glad when the day was over, but that I regretted I didn't savor it more while it was happening. ...my trusty helpers came and helped me make 10 new pinecone bird feeders to keep our birds happy. The birds just didn't much care for the suet feeder that I used to replace the original pine cones, so we refilled the originals and made some more. We made enough to tide us over until the next visit, I hope! We hung two of them up before the boys went home today, and the birds have already found them and are chowing down. 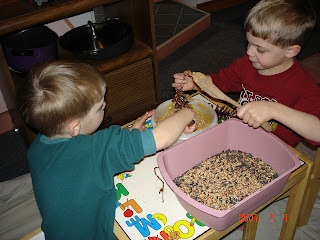 Making pine cone bird feeders is a messy job, just perfect for little boys, although Nick, like his grandma, doesn't really like to have messy hands. He enjoyed the work, but he wanted clean hands right after he was finished! The bird feeder project was just one of the fun things we did this weekend. Just having the boys and their mother here was a weekend brightener, but the rest of the family came out for a visit yesterday, too. All we missed was Andy, and we did miss him. However, the rest of us had a very nice day. It's not often that we have all three kids and their families at home at one time, usually only for major holidays, but it just serendipitously worked out that both Chip and Doug, who usually work on Saturdays, were off. (Boy, that was a long sentence, wasn't it?) I got to cook for the family for a change, as we usually order pizza or something. Not that I fixed a fancy meal or anything, but it was something everyone liked. It was too bad that Chip, Shira, and Aiva had to leave before supper, but they were going out to eat before they went home, so I'm sure they had a nice meal, too. Things had been very quiet around here lately, but life seems to be starting up again. 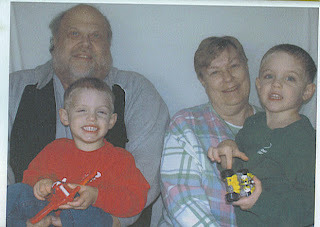 Yesterday and this morning the house was abuzz with activity that made both Grandpa and me happy. Even with the unrelenting cold weather, maybe this is a sign of spring--both of the season and the spirit. :) Life is good! One of the things that made me happiest was telling Nick to come back soon and hear him say, "I will come back ANY time!" It makes us old grandparents feel good to know that the kids are as happy to see us as we are to see them! Did I mention cold weather? I guess that's the worst I can come up with, and it's not so bad. If that's the worst life has to offer me, then I know I have much for which to be grateful. I'll save that for another post, though. Life is good! Alissa believes she was not cut out to be a mom and that she is basically a loner. I, on the other hand, grew up believing that the ultimate career for me would be a wife and mother. I was a child of the 50's, and that was the aspiration for many, if not most, of the girls of my generation. I went to college and got a degree so that I could have a respectable profession, but I always hoped that I would get married and settle down with a family, using my profession as a back-up in case I never got married. I did very well in college and graduated to become an elementary school teacher. Within 2 weeks, I was married. I taught in a middle school for three years to save enough money for a down payment on a house, and then I gratefully "retired" to become a housewife and mom. A year later, in 1974, Alissa was born. I hadn't been such great shakes as a middle school teacher, and I wasn't a very good housewife because as I've said before, I don't like cleaning much. But when I was pregnant with Alissa, I decided that a mother was what I was born to be. I eagerly anticipated her birth, which was two weeks late. And then reality set in. Suddenly I was totally responsible for this little person. I was on call 24 hours a day. That was a heavy responsibility. It seemed that she wasn't much of a sleeper, and I spent a great deal of time taking care of her. And it just kept multiplying. In 1977, just as Alissa was developing a little bit of independence, along came Chip. In 1980, just as Chip was exiting the baby stage, along came Doug. By then we were living on a small farm in a small rural community about 40 minutes away from my parents and long distance calls from my mom's advice. I was a stay-at-home mom like I'd always wanted to be, and I was pretty isolated, too. It wasn't all I thought it would be. I had pictured myself as Harriet Nelson or June Cleaver, but I was never that wise or sweet. Mainly, my kids had only each other to play with, and they got on each other's and my nerves quite a bit. I tried to do interesting things with them, but they had very different interests, so that didn't always work. It was usually worst in the winter, when we were all cooped up in the house, and school was out for snow, which happens at the drop of a snowflake in our county. I was always surrounded by kids who were, like Alissa's, full of energy and questions. Soccer balls bounced off the walls, toys were scattered everywhere, and one was always complaining about the other two. They did have their own rooms, to which I sometimes sent them just so I could have a moment of peace, but they still got on my nerves. There were many, many times when I would just think, like the commercial said, "Calgon! Take me away!" A bubble bath in a tropical setting sounded great, but it never materialized. I was trapped in a pattern of early rising and child care and housework, and I felt that all I would like was just one afternoon of peace and quiet with nobody else in the house and no responsibilities. It rarely happened, but I reasoned that someday I would have that peace and privacy when they were all grown up. Then I went back to teaching, and the beat went on.